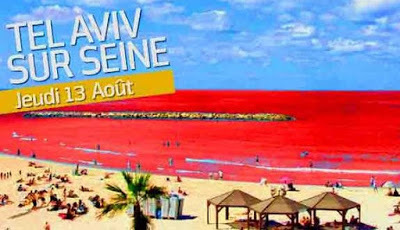 On August 13th, 2015, Paris-plages (Paris-beaches) will become, for 12 hours,Tel Aviv-sur-Seine. A brilliant idea, and, let us not doubt, a very brave one on the part of the Socialist mayor of Paris, Anne Hidalgo. It is especially timely in that it commemorates the Israeli massacre in Gaza in the summer of 2014, in which more than 2,200 Palestinians were killed, including 551 children, and while the ashes of the Palestinian baby Ali Dawabcheh, burned alive by Israeli settlers, are still smouldering. It is true that this time, it was not white phosphorus, but simple Molotov cocktails, and they caused only two victims: one must definitely be blind not to see that Israel is really committed to a sane process of moderation in its Palestinian policy. According to official voices, it is not a case of whitewashing the Israeli regime or becoming a mouthpiece for its propaganda, on the contrary : Bruno Julliard, the glorious Deputy Mayor of Paris, warned against “amalgams between the brutal settlement policy of the Israeli government and the city of Tel Aviv which is a progressive city, a symbol of peace and tolerance.” Indeed, this project would be nothing short of an initiative for peace, highlighting Tel Aviv not as the internationally recognized capital of Israel, and thus archetypal symbol of its policy, but rather, according to the words of Anne Hidalgo, as “a city open to all minorities, including sexual” (yes, the Palestinians who are not shot down or incinerated are expropriated daily, but homosexuals around the world do come there to celebrate the Gay Pride, is it not so? …), and even nothing less than “the first opposition city in Israel… hated in Israel itself as such by all intolerants”, a statement as meaningless as it is grotesque. And it would be unfair, says Ms Hidalgo, to “make a city or population accountable to the policy of its government. It would be to scorn local democracy and thus democracy itself” – let us not mention the fact that more than 90% of the Israeli public supported the last operation against Gaza, or, in strictly rational terms, the very principle of international sanctions against a country, a supposedly democratic one to boot. Faced with such falsifications, such impudence, such contortionism and such abjection, words fail and nausea stirs in the heart. And from the elected officials, we can only find a semblance of refuge in this statement from Danielle Simonnet, Paris Councillor (Left Party), who denounced “the cynicism of the organization of such a day [that] reaches the heights of indecency”, calling for its cancellation or a radical modification of its program. Apart from the appalling political sphere, a storm of voices in France have arisen to condemn this event, and social networks are running riot so that the day promises to be incredibly tense, and will certainly bring to Parisians an impression that is a little more faithful to the reality of life in occupied Palestine than the originally scheduled “festive atmosphere”. Because democracy requires it, no question of modifying a program meant to meet the desiderata of a tiny minority of the population at the expense of the vast majority of French who legitimately say they are shocked by such an event (over 90% according to a survey by RMC / BFM). Everything has been said elsewhere about the ins and outs of this ignominious day, so for our part, we will ask this: does France disown itself by arbitrarily making its capital an auxiliary in the service of propaganda for Israel’s Zionist and terrorist regime, so as to polish up its bloodied image and to promote its sluggish tourism? Does France violate its traditions by becoming a vassal of the all-powerful Zionist lobby, not to say the gay lobby, two infinitesimal cliques who now dictate their most extravagant wishes to the “mother of arms, arts and laws of yesteryear and see it invariably bow to them? Certainly not. Two telling examples are enough to indicate that collaborationism is deeply rooted in a certain “republican” French elite, and that there would be room for talk of, beyond the famous Stockholm Syndrome, a veritable “Paris Syndrome” to describe this historical “French fin’amor” for foreign Occupants. You want to see the sea? Hear the sound of waves? In 1870, after the debacle of Sedan and the fall of the Second Empire, the Third Republic was proclaimed in Paris, to the great fear of the propertied. Despite the state of war and the presence of Prussian troops on national soil, the French political and economic elite did not fear the outside enemy as much as the inside, fearing with a holy terror a victory of the French people in arms which could cause a disruption of economic and social structures. Thus the effort of the “Governmentof National Defence” which was formed by the Jules brotherhood –Favre, Simon, Ferry, capped by Trochu and (Adolphe) Thiers – consisted mainly of sabotaging all impulses of popular resistance and of seeking an armistice with Bismarck as quickly as possible and at any price. The loss of Alsace and Lorraine seemed very insignificant in comparison with “Social Defence”, of preservation of the privileges of the established order, and after the treason of Bazaine and the simulacrum of the Siege of Paris, it could finally be imposed on the Nation. It was then time, finally, to turn the French cannons against the real enemy, namely the suburbs of Paris, under the approving eye of Bismarck. The historianHenri Guillemin, [France’s Howard Zinn, Noam Chomsky and Norman Finkelstein altogether] has demonstrated this in minute detail in his trilogy The Origins of the Commune (This curious war of 1870, The Heroic Defence of Paris andThe Surrender), synthesized in his series of eponymous conferences . In 1940, it more or less went the same way. The French political and economic elites saw in Nazi Germany a danger infinitely less great than the socialist threat (at that time this doctrine had not been perverted and carried genuinely progressive values), and, more importantly, considered that a military “disaster” might enable France to reconnect with its reactionary traditions and repeal many heresies introduced by the Popular Front. This was in particular a special effort of Petain, who worked in that direction at least from 1936. And around him, many are they who opted for The choice of defeat, in the words of the historian Annie Lacroix-Riz. Again, Henri Guillemin has established these facts in his works Nationalists and Nationals (1870 – 1940) and The Truth About the Petain Case, condensed into his corresponding series of conferences . In one case as in the other, Paris was occupied by the enemy, Bismarckian Prussia in 1871, Nazi Germany in 1940. It is difficult to talk about anything other than high treason by the French elites, although the political and historiographical tradition continues to praise most of its protagonists to the skies – except Petain, who some would like to rehabilitate: they are right in the sense that Petain only perpetuated a tradition of collaborationism firmly rooted in the Republic, but by targeting the republican regime itself and the Jews, and not only the French proletariat. It cannot be otherwise, as our elites remain deeply engaged in these infamous ways. But if it is established that the French elites, corrupt and stateless, have been constantly trampling the interests of the people and of the Nation at least since the Third Republic, then what about the French people? How did it welcome foreign Occupation in 1871 and in 1940? Henri Guillemin reports that “The Prussians entered Paris on March 1st , and Paris behaved in a very noble way. We must remember what happened at the entrance of the Allies – particularly the Cossacks – in Paris in 1815. There had been hideous scenes. When they had entered the working-class neighbourhoods, nothing moved, but when they arrived in the rich neighbourhoods, on major boulevards, there were ovations. Socialite women rode on the horses behind the Cossacks, who were the ‘Liberators’, the foreigners who came to bring back the King. On 1st March 1871, we see nothing of the kind, while this time, the Germans came through the chic districts of Paris – they came by Neuilly, the 16th and the 8th arrondissements, the Champs-Elysées. Everybody had closed the windows, all the shops were closed: they entered in a deathly silence.” Then, when the mystification of the pseudo-starvation – that would have imposed an armistice – and high treason of the elites were revealed to the people of Paris, there was a general outburst of indignation which culminated with the Commune, to which Parisians of all social classes committed themselves on the 26th of March 1871 by voting overwhelmingly for the “reds”: these had been crushed in the 1870 elections, but now triumphed as the only genuine defenders of the Fatherland. In 1940, when even a small country like Holland, conquered and occupied by the Nazis, could boast of the appointment of the German Seyss-Inquart to lead them (Queen Wilhelmina proclaimed that “the red of shame would have come to our faces if the invader had chosen for this position someone of our nationality. At least we have been spared this ignominy.”), France did not have that luck. It was the only country to engage in the path of the most disgraceful surrender, collaboration and even frenzied collaborationism with the Occupation through its highest legal representative, what’s more a Marshal of France, crowned with a (false) aura as a hero of the First World War. He was followed by the great majority of the French, who cheered him until April 26th, 1944, during his last visit to Paris, while De Gaulle was long a marginal figure. Only a tiny minority of the French engaged in the fight against the Nazis. Two million French fled Paris before the Germans arrived, but the remaining million coexisted peacefully with the Occupying forces. If Paris is, as coined by Louis Veuillot, “the cancer of France and the scandal of the world” in the eyes of “worthy people”, that is the propertied (Veuillot was then expressing his hatred for the Commune), it is for Parisians to return the title against their unworthy and corrupt elites who flout democracy and “ride” on the Zionist tanks, giving an “ovation” to the massacres of the Israeli Occupier. Will we go the way of De Gaulle, of Petain or of the majority of the wait-and-sees? It is everyone’s duty to expose as much as possible this new Occupation of Paris by an entity if not hostile, at least foreign, colonial and terrorist, whose most characteristic seal is infanticide. Today’s resistance certainly will not express itself using force or violence as was required in 1940, but if not by protest and civil disobedience, at least by withdrawal. Parisians must at the least, rather than answer to the call from Anna Hidalgo-Collabo to “come in great numbers”, boycott Paris-plages that day and meet this outrage with a “deathly silence”. And for those in whom the flame of resistance and dignity is still burning, may they infiltrate and disrupt this event as much as possible, individually or in groups, at any time, from all sides, by any peaceful demonstration, making the voice of the French people and that of the Palestinian people heard – shouting, slogans (Israel Terrorist! Hidalgo Collabo! Gaza, Warsaw Ghetto, innocent children facing barbarism!…), leaflets and pictures, flags, banners, burned dolls in memory of Ali Dawabcheh, the Bakr children and the 547 other children killed in Gaza last summer, etc. Let them show inventiveness: the French people, and Paris in particular, have always had enough to spare. This has been shown again during summer 2014, when tens of thousands of Parisians defied the ban of the Paris Prefect of Police (the only one in the world!) to demonstrate in solidarity with Gaza. Indeed, in this Charlie-pseudo-democracy, a little courage is also required, because we should expect to be bluntly arraigned by police – even beaten by the militiamen of the Jewish Defense League, considered as terrorist and banned in Israel and the United States, but having a storefront in France along with total impunity; anyone who wants to strike back for honour’s sake must make sure not to be dealing with police officers in civilian clothes, which won’t be easy – and then suffer up to 48 hours of police custody. These can even be embellished with false charges of outrages, violence, etc., which will nevertheless be solemnly attested by sworn-in liars – I speak with experience: I have not been in prison or appeared before a judge because the lies were too big and contradictory, but I could well have done; we must know that we are dealing with unscrupulous people without honour (they handed over the Jews and hunted and tortured the Resistance fighters to please the occupier, if needed will do it again), but hardly shining lights… But Gaza does deserve that, and this is the price of dignity. I’ll be there, and I hope that many of us will make our voices heard.